The studio was staffed by experienced technicians from Hong Kong and Shanghai, while singers and actors were hired from local bangsawan (Malay opera) troupes. The studio also roped in Indian directors such as Lakshmana Krishnan, B.N. Rao and S. Ramanathan, as audiences enjoyed the 'Bollywood' style with its lively songs and dances. 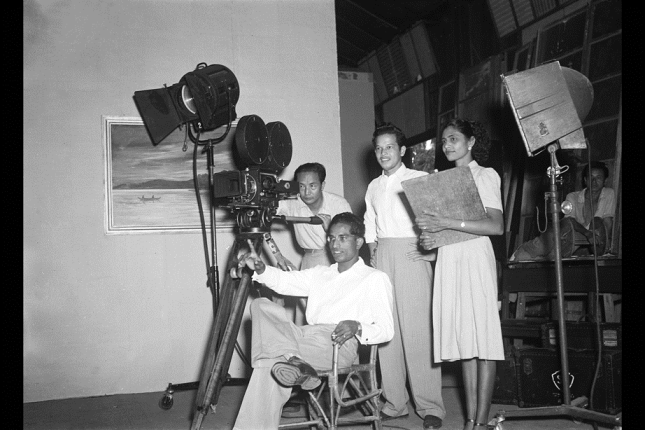 Under the banner of Malay Film Productions Ltd, the studio's film release, Singapura Di-Waktu Malam (Singapore at Night), directed by the celebrated B.S. Rajhans, was a hit in 1947. Besides the old studio plot, there were two other nearby sites (9A and 9B Jalan Ampas) that served as production cetnres for Shaw Studios. Perhaps the most famous name to emerge from the studio is P. Ramlee (1929-1973). P. Ramlee began his career in 1948 as a little-known playback singer in the movie Cinta (Love). His talent was quickly recognised and in 1950, P. Ramlee became the first actor to sing using his own voice in the movie Bakti (Dedication). P. Ramlee's debut as a director came in 1955 with Penarek Becha (Trishaw Puller). In all, P. Ramlee wrote, directed and acted in more than 70 films and composed more than 300 songs. After producing more than 160 films, the Golden Age of Malay Cinema came to an end when the studio closed in 1967. By then, interest in Malay movies was on the wane due to the rising popularity of imported films and television. Shaw then moved its Malay film work to Merdeka Studios in Kuala Lumper, Malaysia. The former studio buildings still remain on the grounds at Jalan Ampas.